Wednesday 28th May 2014 – 12.00noon – Claire Brown. 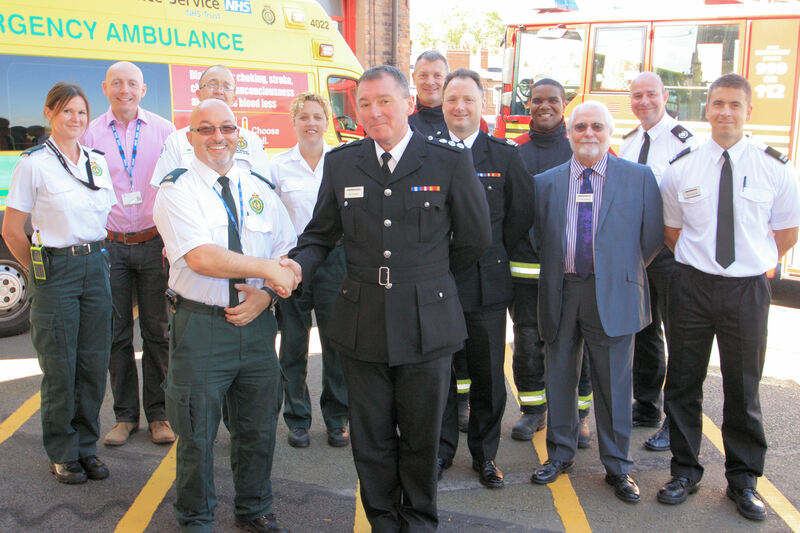 Ambulance staff moved in with their fire service colleagues in Aston last week, marking the start of a new and exciting era of joint partnership working. 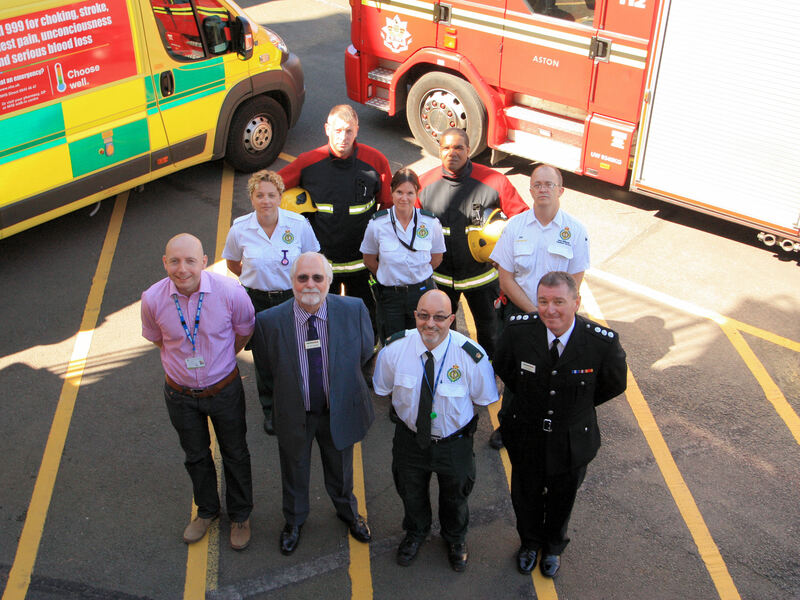 After more than 60 years of calling Henrietta Street Ambulance Station home, ambulance staff based there moved one and a half miles away into a newly refurbished hub on the site of Aston Fire Station on Wednesday 21st May. The hub is on the 1st floor of a building adjacent to the fire service facilities and is self-contained comprising a mess room, dining room, kitchen, locker rooms, toilets, showers, office space and car parking bays for ten ambulance vehicles. West Midlands Fire Service has provided the Trust with the temporary accommodation whilst negotiations continue to build a new joint hub in Aston which could be up and running in about three years’ time. Tony Iommi, the Trust’s Assistant Area Manager for Birmingham Central, said: “The move from Henrietta Street to Aston couldn’t have gone any better. It’s a real testament to the meticulous planning, hard work and professionalism of everyone involved in the project, both from the fire service and ambulance service. “It goes without saying that moving out of Henrietta Street was emotive, as it’s been part of the Trust for such a long time, but I’m confident staff will settle in well at Aston. For many staff, it’s going to mean working alongside the firefighters they’ve been bumping into at jobs for years! The hub is fresh, clean and modern with comfortable facilities for staff and is a world of difference their previous home which was in a state of disrepair. Rob Woolley, West Midlands Fire Service’s Station Commander in Aston, said: “The facility has been transformed, in a relatively short space of time, from a tired and empty building into a really smart hub for the ambulance service. Henrietta Street Ambulance Station went up for sale in Summer 2013 for offers in the region of £475,000 and is currently under offer. There are 44 operational firefighters, two non-operational staff and two appliances based at Aston Fire Station. There are 68 ambulance staff and 9 ambulances based at Aston hub. The Trust’s three motorcycle paramedics, who were based at Henrietta Street, have relocated to a response post in Tower Hill, Great Barr. 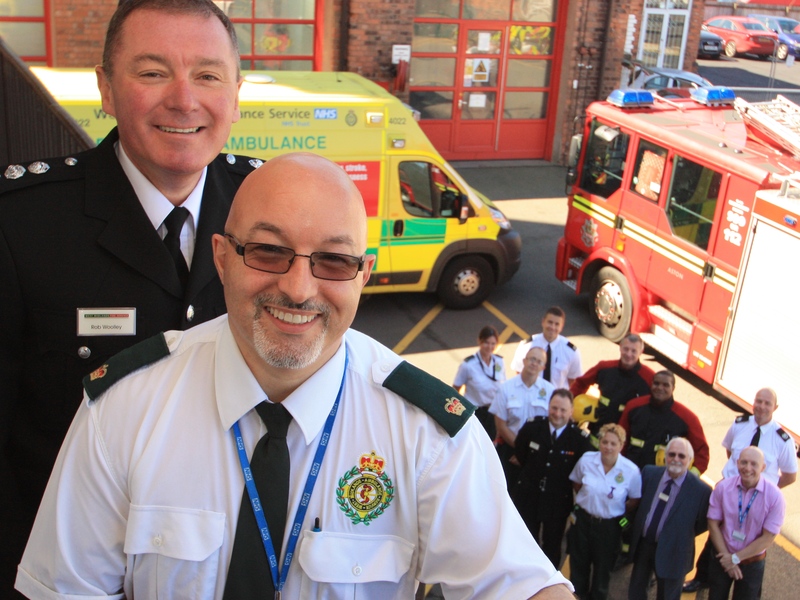 Group photo in front of vehicles: (Front) Assistant Area Manager Tony Iommi and Station Commander Rob Woolley. (Back left to right): Paramedics Alice Whitfield, Adam Aston and Mic Hall, WMAS Staff Side Rep and technician Corrie Martin, Firefighter Jez Boxley, Area Commander Steve Vincent, Firefighter Rohan Hazel, Chair of WMFS Authority Cllr John Edwards, Group Commander Dave Boucher and Crew Commander Mark Woodward.